You all know how much I love Zimmermann right? I highlight their effortless, breezy pieces each season in THE EDIT, NYFW recaps and more. I’m obsessed! While I do like to invest in some of their pieces occasionally (I currently own a romper, two dresses and a one-piece), I obviously can’t afford to buy everything from their collection (womp womp). Even though I’m not always buying Zimmermann, doesn’t mean I can’t have the look for less! I recently came across this under $100 blouse and it was giving off all the Zimmermann vibes. It features the most beautiful, subtle floral print, a bohemian and billowy silhouette, and shiny gold grommet details to elevate the look. Don’t y’all just love it?! It’s nearly sold out at Nordstrom, but I did happen to find it in stock in a bunch of sizes here. 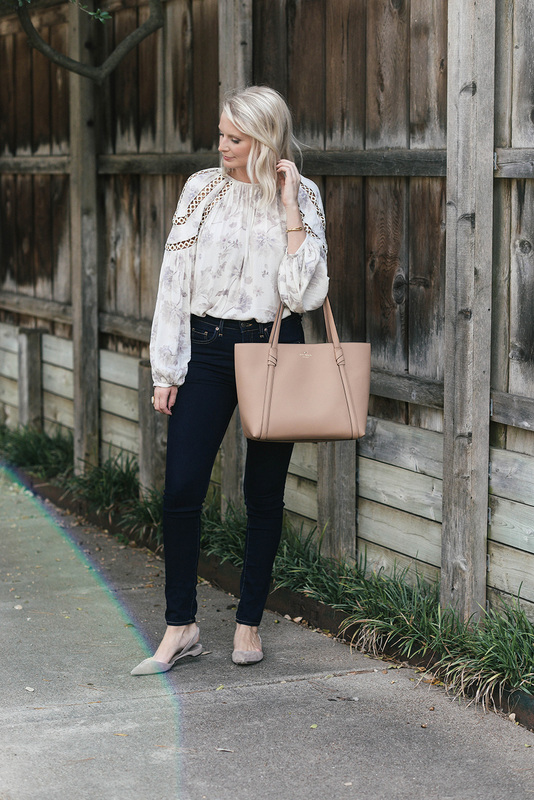 I highly recommend this blouse if you’re looking for a chic day-to-night top with special details on a budget. I’m so happy with it! On another note, you can’t really see the earrings I’m wearing, but I’ve been wearing them non-stop! I picked them up at a Lele Sadoughi trunkshow, but you can shop them online here. They’re lightweight and comfortable to wear all day (I wore mine to the Boulevard and out a couple weeks back! ), and the neutral shade of the earrings is incredibly versatile. SHOP MORE PRETTY BLOUSES UNDER $100 BELOW! Add some fall color with a top like this from J.O.A. So pretty! Loving the ruffle cuff detail on this plaid shirt. It looks so comfy for fall and that extra detail gives it a more elevated look! As you know, leopard is a huge trend this season! 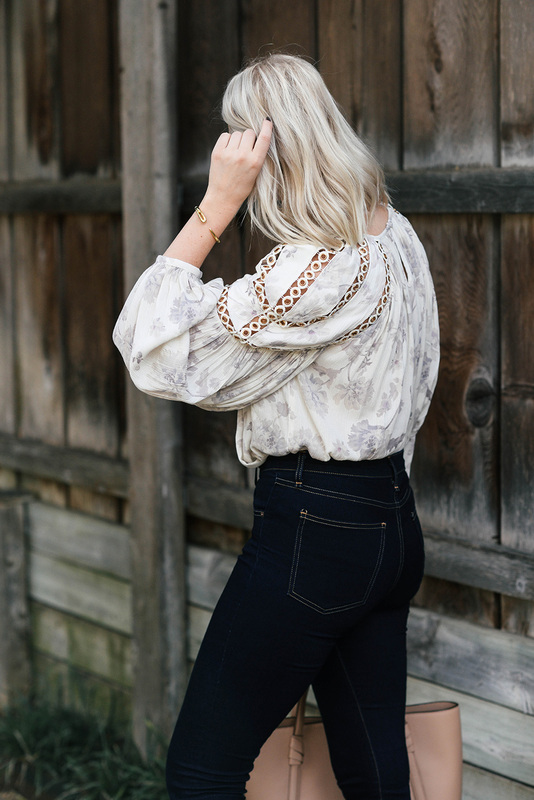 Snag this off-shoulder blouse for an on-trend item to throw on day or night. Fall florals are better than ever in this paisley rendition from LOFT! Topshop nails it again with the whimsical blouses! The broderie anglaise detail can’t be beat. Love the neutral color and poofy sleeves on this cute little babydoll top! 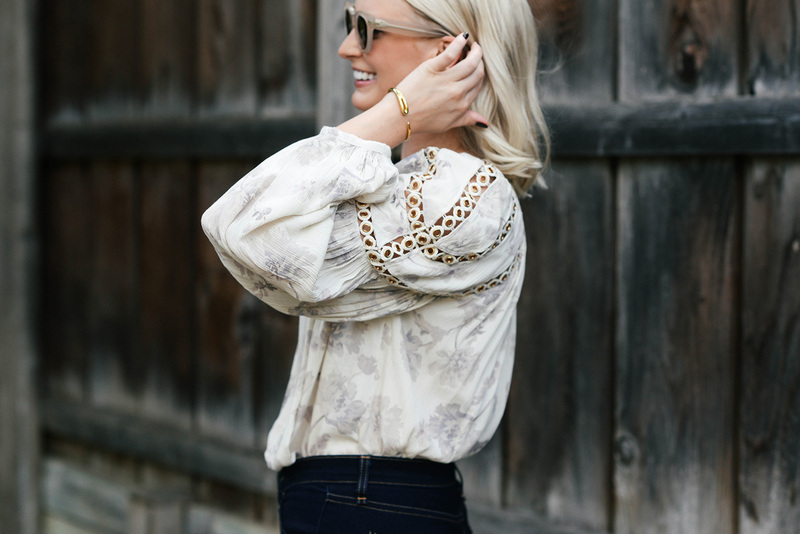 The subtle print and cascading ruffle on this long-sleeve blouse make it pretty and perfect for work! Add a trendy touch to your work wardrobe with a drawstring ruched sleeve and neckline. This top is so pretty. That blouse is gorgeous! I love the print and details on the shoulder! love the details on the shoulders, so pretty!